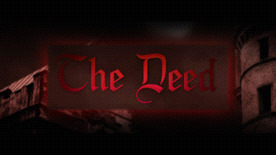 A keenly dark twist on the traditional murder mystery setting, The Deed is an Adventure/RPG game about getting away with murder. Arran Bruce, the rightful heir to Dunshiel House, returns to his family home after discovering that his abusive father has decided to disinherit him from his Will in favour of his sadistic, deranged young sister. In a fit of anger and greed, Arran has decided to remove his sister from the equation in order to restore his own inheritance. Can he manage to get away with such a foul deed? Explore Dunshiel House and encounter Arran's twisted, dysfunctional family and their servants. Take care, though - everything that you say or do can have an impact on the outcome of The Deed! Father, mother, maid, butler ... any of these individuals could take the blame for your heinous act, if you can find the right evidence, plant it in the right location and manage to raise the suspicions of the Inspector.